I went down US180 back in May when I was going from Socorro, New Mexico to Silver City for a night photography workshop. 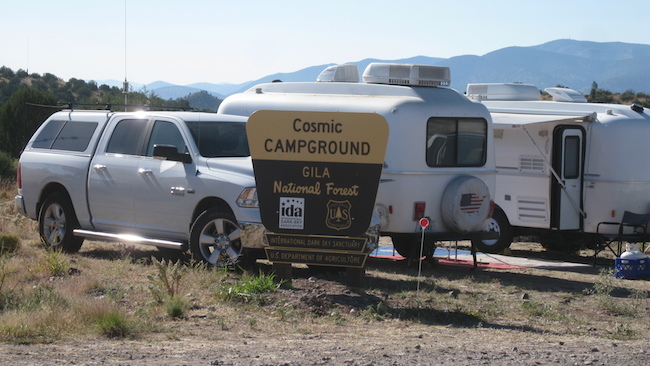 I passed the simple sign "<-- Cosmic Campground" out on the highway and thought to myself, "Oh dear, Taos and Santa Fe comes to Catron County." That would be kinda like mixing oil and water wth the oil on fire. Didn't think much more about it and just kept on driving. Almost six months later I ended up there! It turns out the name doesn't have anything to do with Taos or Santa Fe, and now it makes perfect sense. Stolen from the campground website. Cosmic Campground is a place just for geeks that like to run around in the dark and play with their shiny toys! "Cosmic" is THAT kind of cosmic. 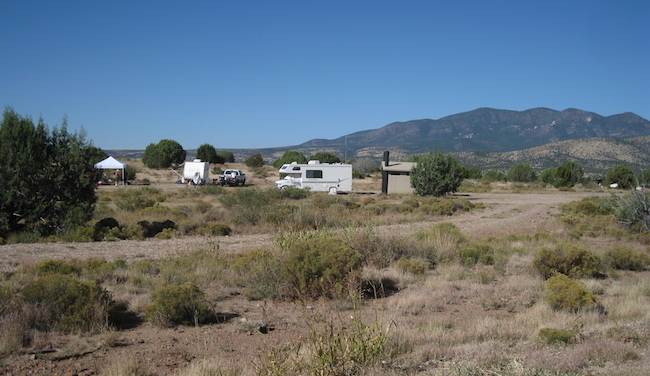 It's near Alma, New Mexico, and is at least tens of miles from just about everything else in the Gila National Forest. After years of paperwork the campground finally came into its own just this past summer. Everything was still shiny and new. OK, since this was New Mexico everything was mostly just dirt or covered with dirt, but the dirt was still nicely arranged. The campground is missing everything you don't want for some real nice astro-camping. No big trees. No tall mountians. No city lights. No electricity to attract light bulbs. Not a lot of bears or mountain lions. (No one was eaten over the weekend, so I'm assuming on the last one.) 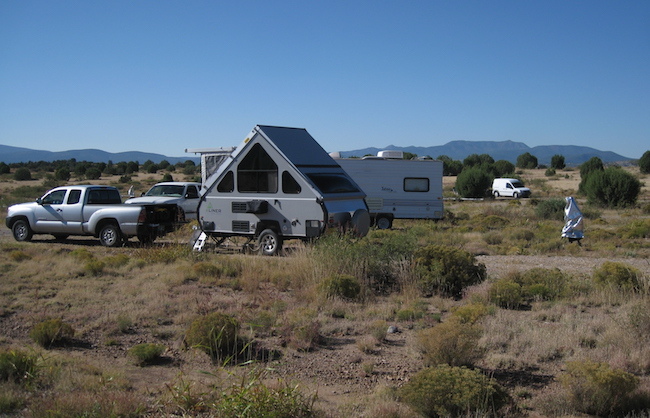 There are seven official camp sites with many places where you can fit more campers. The road to the campground dead ends just a little further down, so there's no through traffic. The only complaint was that there isn't a fresh water well, but that was the only thing to complain about. Everyone brought water, so it was more of a comment. Through lots of lobbying the campground was able to exist, and because of where it was it was able to become the first International Dark Sky Sanctuary in the United States as awarded by the International Dark Sky Association. There is only one other sanctuary in the world in Chile. It was dark. "How dark was it? ", for you Johnny Carson fans... It was so dark that it wasn't dark at all, because of the light from the Milky Way! You couldn't quite do some equipment fiddling without a flashlight, but walking around was pretty easy without one and that was just from the glow of the sky and the light from the stars. The moon wasn't around. That was the way this weekend was planned. 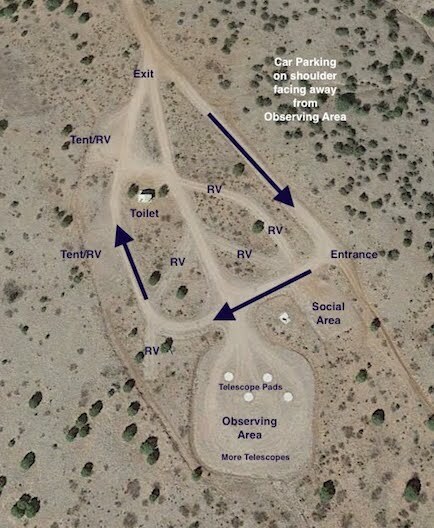 In the future the forest service has plans to build a 'regular' campground along the same road for non-geeks, but way up by the highway, so this one can be kept dark and just for observing. Nice! This part of the forest is a nice area for regular camping. That's my trusy 2017 Aliner portable astronomical unit. Some people took the cement pads made just for perching telescopes on, and some people set up their telescopes near their campers. Mine was just behind my Aliner. The mount is wrapped in a Telegizmo telescope cover. On this trip I was going to try out the DC to AC inverter I had installed in the trailer. I connected it to the outside power outlet on the trailer so I could power laptops and things at the telescope. I needed the scope within extension cord range. There's not much out here and that's just the way it needs to be. As I recall I think that mountain is the tallest obsruction, and it is in the northeast. 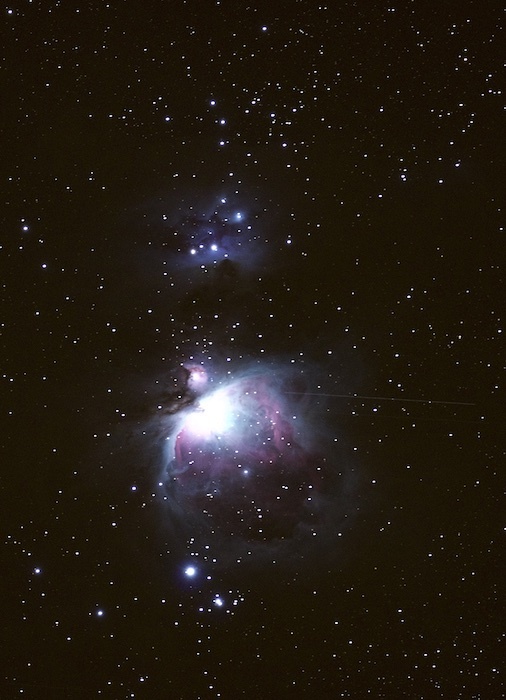 M42, Orion Nebula. Sky-Watcher Esprit 80mm, Canon T6i. So I'm still in the baby steps of picture taking with this stuff, but it was kinda hard to mess up with the weather and lack of stray light that we had out there. It was not very cold and there wasn't much wind. Very nice. From the looks of the weather reports I would wager that the place was covered in water less than a week after we were there. Perfect timing. 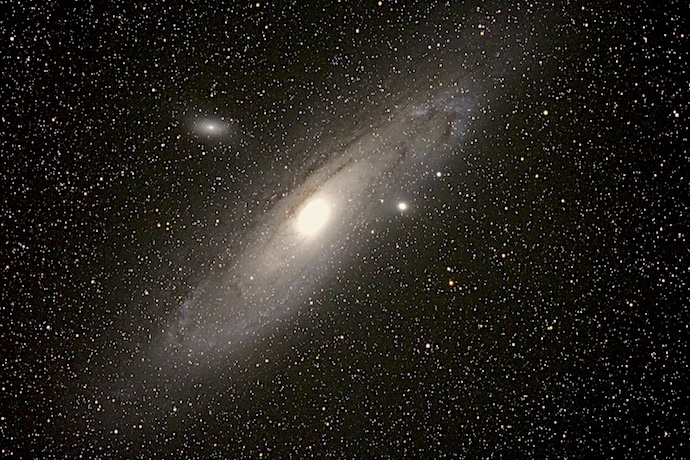 M31/M32, The Andromeda Galaxy. Sky-Watcher Esprit 80, Canon T6i. I got a lot of time just to play around with the equipment on this trip. That's something I hardly ever get to do, because at a 'regular' campground it gets quiet at 10pm and you hate to be making noise after that. It's also a good idea to kinda pack everything up at the end of the evening so nothing will happen to it. With just us there you saw a bunch of little red flashlights moving around after 10pm, and the other guys all had way better stuff than I did, so I didn't have to worry about things getting stolen. I just took the scope off the mount in case the wind came up, and so it wouldn't bake in the sun the next day, and went to bed at about 3:30am. What a concept. I was on this little weekend trek at the invitation of several guys from the astronomy club in Las Cruces, New Mexico, and a couple of guys from over in Texas. They all knew each other through the star party circuit. I'm just starting out. Had a great time! Since this place is just down the road a bit from where I usually go camping I'll for sure be going back.